28 Neighbors from Alameda, Concordia, and Beaumont-Wilshire neighborhoods came together on Monday, March 19 to form the Friends of Wilshire Park, a grassroots organization dedicated to caring for and improving Wilshire Park. Yvonne Boisvert, Vice President of the Friends of Peninsula Park Rose Garden, spoke to the group, describing the ways their organization had found success and providing valuable advice on how to get off the ground as a new community group. She recommended finding a motto that clearly defined the group’s purpose and starting with a small, well-defined, attainable project and using that as a springboard for larger successes. Yvonne Boisvert addresses the newly formed Friends of Wilshire Park. Photo by Barbara Linssen. The members broke into discussion groups to share ideas and goals for the children’s play equipment, the off-leash dog area, the jogging track, and native habitat enhancement. 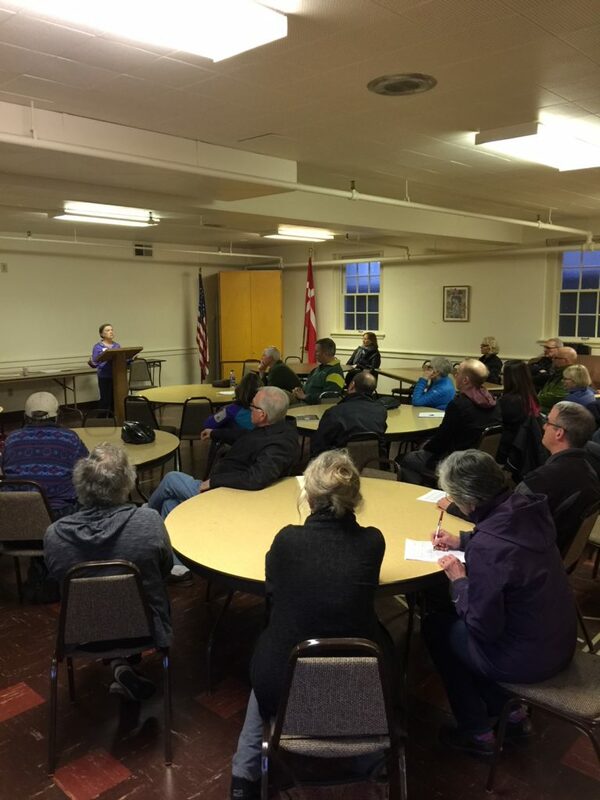 After coming back together as a large group, the meeting adjourned with a challenge for members to spread the word to friends and neighbors who enjoy Wilshire Park that they now have a chance to get involved in its improvement. The group’s next meeting will take place on Wednesday, April 25 at 7:00 pm at Bethany Lutheran Church, located at 4330 NE 37th Avenue, Portland. All members of the public interested in making improvements to Wilshire Park are welcome. Find friends. Expanding the circle of people and resources is always better. Lots of help is needed for big community based projects. Having lots of people who can bring in gardening and construction equipment is very helpful. There are lots of Master Gardeners in Portland, and their advice is extremely valuable. Have a mission statement that clearly communicates the values and purpose of the group so it can be used as a lodestar. The tagline for the Peninsula Park group, for example, is “Preserving Portland’s First Rose Garden.” Words such as “protect,” “preserve,” and “enhance” send a strong message to volunteers, community members, and the city. The credibility of the group will then depend on adhering strongly to its mission. Money. No community group can raise funds without a fiscal sponsor of some kind. Many park friends groups eventually choose to become their own 501(c)3 organization, but many others are able to raise funds in conjunction with similarly aligned groups such as neighborhood associations or the Portland Parks Foundation. The group divided into breakaway discussion groups based on area of interest to meet one another and come up with wish lists for park improvements. Some time ago funds were allocated to convert the dilapitated wading pool into a modern splash pad. However, the project has not been initiated. The group felt this was low hanging fruit as we would not need to plan, secure funds, or get a permit; rather we could do what we can to get this project rolling. The toddler play area is heavily used and a good community asset because none of the other nearby parks have a mix of equipment for very little children and older kids. However, the toddler equipment is in very bad shape, with splintery plywood and rotting boards. Securing funding for new equipment is a high priority. The larger equipment is in fairly good shape and should be considered a low priority for now. More seating at the center of the play area would be useful, as parents are often monitoring kids of different ages. Some sort of shelter for the sand pit would allow for year-round use. The sand is so wet most of the year that children can’t enjoy it. Oren Bernstein presented concept art of possible play equipment that would harmonize with the natural habitat of the park. Complete fencing around the entire dog play area (or at least along Skidmore and 37th Street sides), in order to provide a safer environment for the dogs to play and to also keep them in the designated play area. Provide a fenced area within the larger area to allow a safe play spot for only smaller dogs to interact — perhaps up to 25 pounds, or so. Many of the dogs coming to the dog park are quite large and a danger to the little ones. A water source for drinking water for the dogs would be much appreciated. Currently, a very kind woman across the street leaves her hose on for this purpose, but it shouldn’t be her responsibility or expense to provide water for those using the park. Dogs get very thirsty during vigorous play. Creation of a “nature pocket” with low maintenance native landscaping to provide understory for birds. We reviewed our discussions with representatives of the Department of Parks and Recreation and the fact that we had toured Wilshire Park with some of them to identify places where pockets of landscaped native plantings could create “nature rooms” without interfering with other park functions or park security. A high priority is to make the park more beautiful and bird friendly while keeping maintenance low. The group has a draft landscape design that a volunteer landscape architect has created for a pilot program in one of these spaces. The severe budgetary constraints now imposed on the Department of Parks and Rec were raised and the consensus was that if this project was to move forward, funding needed to come from outside grant monies or contributions. Several ideas of how this project could meet some of the needs of underserved communities were discussed. The track is currently uneven and unsafe. Some areas have large chunks of wood that can lead to ankle rolls, and in some areas the bark mulch has broken down so much that it is quite muddy. This has lead to runners using the outside edge of the track to avoid mud, soft depressions, and “ankle buster” bark chunks, so the track is too wide. These problems are made worse by city parks crews driving on the track. A realignment of the track which removed existing bark and applying a finer surface would allow for a narrower, better defined, safer track. There are different options for a track surface, such as 3/8″ or finer gravel, recycled rubber, or fine grade mulch. There were many different preferences. Gravel is durable but harder on runners’ joints. Fine grade mulch is easier on runners but would need frequent replacing. Recycled rubber may be prohibitively expensive and would require maintenance. Costs of realigning the track need to be researched further. The meeting adjourned with plans to meet again on April 25.